Due to the overwhelming response to these heels on my Instagram last week, I chose to feature them for my September Remix item! Even though they were on massive clearance at Dillards (and still are! ), I wasn't sure how much sense it made to buy them since they're not exactly practical... But, they're crazy fun and I think they're so cute! They do have a lot of colors in addition to being the very versatile color of cognac, and I plan to bring them along with me as summer moves into fall. For my first look I thought it would be fun to style a little going out look. Leather is one of my very favorite trends this fall, so I didn't miss an opportunity to style this skirt. I like to think that this outfit is fairly simple, but packs a big punch. Hope you enjoy the remix series this month! OMG I am in love with your heels, sooo cute. i love unusual (to me) pieces like these. they're stunning and unlike anything else. those shoes are hot!! love that skirt too girl! Me gusta mucho tu falda de cuero!!! Queda genial con la camiseta naranja!!! 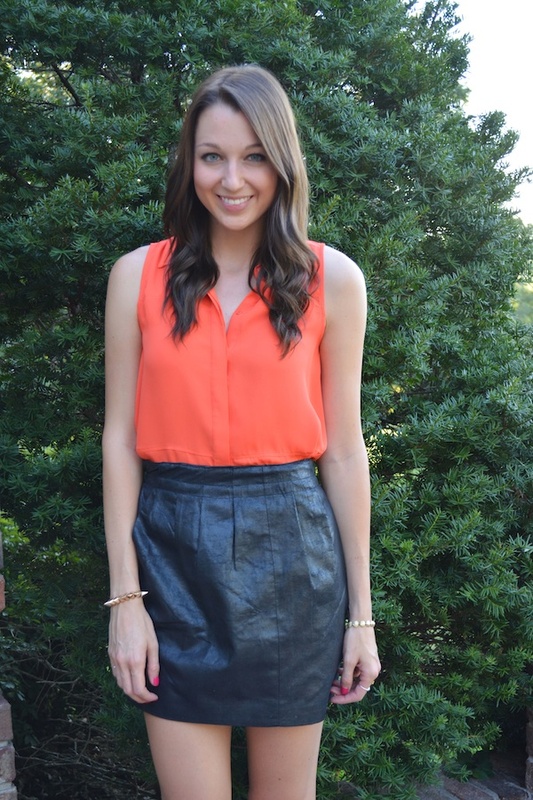 Love the orange with the leather skirt. And yes, those heels are to die for! i saw these on your insta and became obsessed!! great find, jacy! Fun and not exactly practical shoes (that are on sale) are my absolute favorite. Those were too good to pass up! Jacy!!!!! Those heels are everything dreams are made of! Holy cow they are sooo hot! So glad you decided to buy them! Come spring/next summer you're going to have these on heavy rotation! Love the look girl! I'm sure all of the comments justified the heels already, but they're STUNNING!!! How fabulous are these?! Seriously, they're so killer–I can't wait to see how you mix them up! Absolutely beautiful! Love your heels and your whole outfit! great ensemble, love the leather skirt! Thanks for your great comment...I am so impressed by your healthy diet, I need to include more healthy snacks in mine. Happy Weekend Sweetheart!